Full Tilt Poker has been closed down since May last year, but on the 6th of November it opened up for play again. This time with a new owner (PokerStars). So I believe that many former Full Tilt players were ready to withdraw their money. Even more interesting is how many started playing? 15 minutes after launch there were over 10.000 players logged in, and they already have an average of 8200 cash players playing (See image 1). As you can see in the image above Full Tilt Poker is the second most popular poker site out there, after PokerStars (their owners). So why do players come back and play? Shouldn’t the rest of the poker industry be a few steps ahead? Actually I believe that Full Tilt keeps going from where they left off. 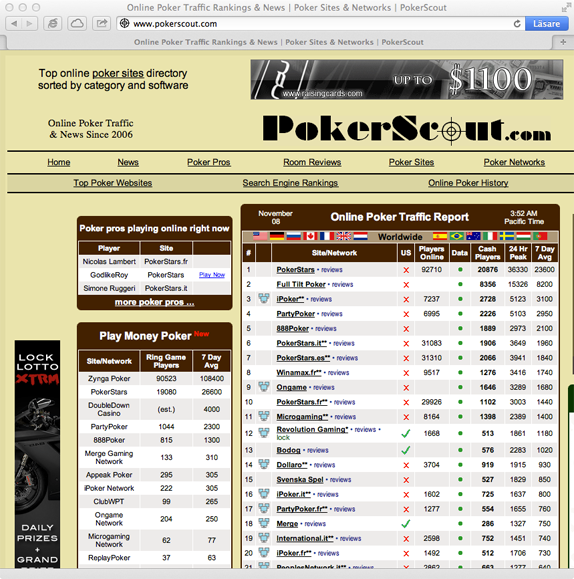 They do have a great poker client which I believe is among the best in the market. It will be very interesting to see if Full Tilt will continue to have a high number of players even after a couple of weeks. I think they will, and I think the rest of the poker industry have lost a great opportunity to take the second place behind PokerStars.